Over medium heat, melt butter in a skillet. Sauté shrimp for 5-6 minutes until fully cooked. Set aside. Slice eggs in half, and scoop out yolks into a mixing bowl. Add avocado, mayonnaise, salt, black pepper, sugar, and honey mustard into the bowl with the egg yolks. Mix until smooth and combined. Set aside. In a separate small bowl make the aioli by combining mayonnaise, lemon juice, chili oil, and Sweet & Spicy Sriracha Lime seasoning. Scoop egg yolk mixture into empty egg halves. Top each egg with one shrimp. 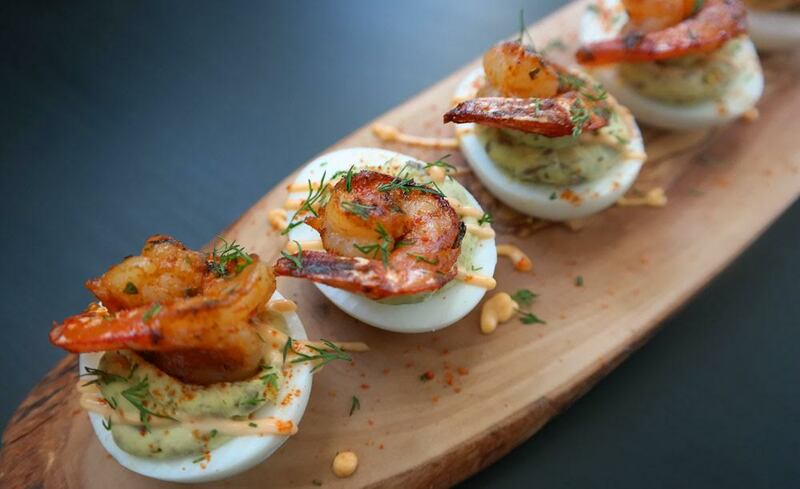 Drizzle each deviled egg with aioli and sprinkle with additional Sweet & Spicy Sriracha Lime seasoning. Garnish with fresh dill if desired.